I have really REALLY mixed feelings about this brilliant idea from Artopotmus. When I first saw it over at OhDeDoh my first thought was brilliant! Because it is. If you have kids you know that markers and lids never seem to find their way back to each other. We lose at least one every time we spread out the art supplies. But on the other hand, I am a bit of an art supply hoarder. We won't talk about how many packages of new crayons and markers I buy in August when they go on 'back to school' sale. It is a lot. Like a lot, a lot. And the only time I really can bring myself to toss markers is when I find them dried up on the floor. And now I have a reason to keep them. So thank you. And curse you. But the kids are going to love it! See the steps to creating your own liquid water colors HERE. 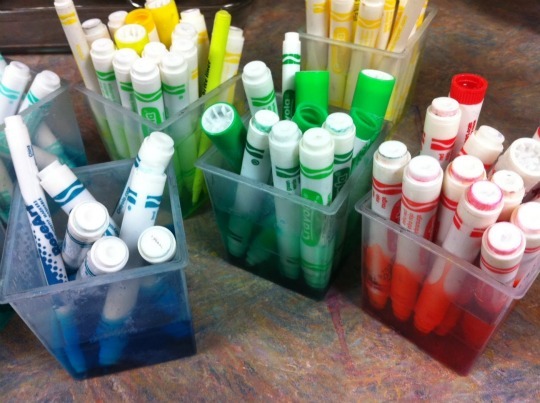 Great idea to reuse old markers or when the tip dries up. My nieces tend to always never put the caps back on the markers! I have plenty of paint at home and can create this for them when they are playing outdoors!